I just talked to the Mother Prioress and she said something was missing in my absence. Sniff...but one cannot pretend to do what one cannot do physically. God bless those Spiritual Marines. I am writing to encourage the laity to a personal relationship with Christ which will lead each lay person to union with Christ. This is not only possible, but God's Will. 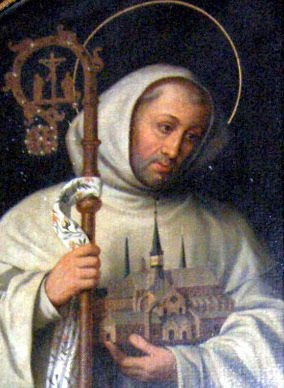 The reason I encourage reading is that is the first step on the chair to Contemplation as taught by St. Bernard of Clairvaux. We must read the right books, however. Some people get bogged down in conversion stories. That is only a beginning. Let me encourage the daily reading of Scripture, or the Lectio Divina. Here is what Suarez states about Bernard's first step, which overlaps with what St. Thomas Aquinas writes, is important on the life of those seeking contemplation. Reading...is the first elevation of the mind to God, for by reading we learn and receive that which by meditation we preserve and digest, and so by degrees the soul is inflamed towards God; or, to quote St. Bernard, it is the first step of the four steps of the cloister stair, which are reading, meditation, prayer and contemplation. ...Reading seeks, meditation finds, prayer begs, and contemplation relishes. Yesterday, I had a fairly long conversation with a holy young man who is seeking God daily. He was defending those in his generation who do not know their faith, nor take, or "have" time for the Catechism, or other reading, such as the Scriptures. They will be lost. A priority for finding out the faith is essential for every Catholic adult. And, one over 18 is an adult. Whether someone decides to be in the psychological state of a child and not take responsibility for spiritual growth or not, each one of us is responsible. The graces of the sacraments, especially the Eucharist, aid us on our way. I pointed out that without a philosophical grounding in Catholic thought and an understanding of their faith, these young people will not make good decisions for their lives. Without discernment based on reading and the moral framework of the Catholic Church, these youth will flounder. St. Bernard writes, Reading without meditation is arid, meditation without reading is exposed to error, prayer without meditation is tepid, meditation without prayer is unfruitful; prayer with the devotion of contemplation is acquisitive, while the attainment of contemplation without prayer is either rare, or it is miraculous. Suarez in good logical form states these are the beginning, the middle and the end of contemplation. This is why I list books on this blog. I shall continue later with the other three steps. I grew in a family which identified things in nature: we knew and still know the names of trees, flowers, both wild and cultivated, birds and other animals, type of rocks and so on. That is because we were outside a lot. We grew up going outside, for walks, hikes, camping trips, historical pilgrimages and religious pilgrimages. We knew we were part of nature. In the past two months at the monastery, I went walking in the beautiful Bible Garden daily. The nuns have their own, secluded garden which adjoins the more public one. In all that time, there was only one other nun who I saw taking regular exercise outside and she is English. Somehow, nature must be part of the life of the religious. St. Bernard knew this, and St. Benedict encouraged outside work. This is missing from so many monasteries. There are some which still farm and have orchards, plant vegetable gardens and herbal gardens. 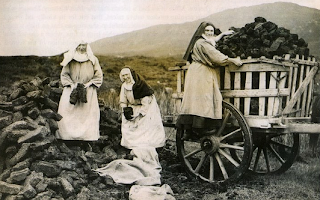 But, because of the dropping of vocations, so many orders can no longer maintain the farms and orchards of the past. 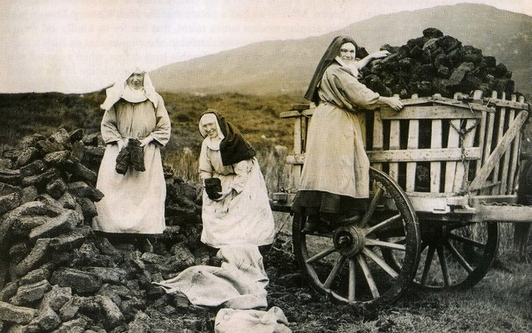 Five healthy nuns cannot maintain a farm, or even a large garden. This, to me, causes a lack of communion with God through nature. 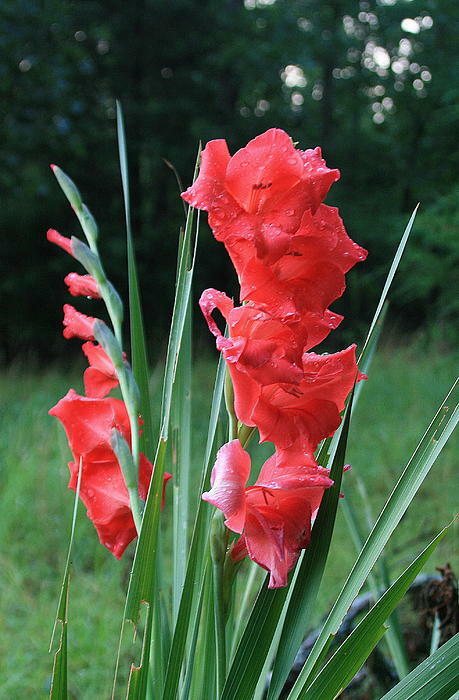 One of the flowers in the garden was the gladiolus, or the Roman sword, as it is sometimes called. I love this flower and the one in this particular place was bright coral. I have written a poem about it. I watched that flower endure high winds, fog, slashing rain and cold. Yet, it bloomed up to November 12th and another set of flowers was coming up behind the stem I saw. God teaches us through nature and in this case I learned several things. One, plants need certain things to grow-water, good soil, sunshine. God gives them what they need. Two, plants persevere through harsh weather, if the roots are good. Third, beauty is from God to be enjoyed and to cause us to praise Him. The younger nuns sing the verses referring to Orion and the Pleiades. These are in Amos and Job. I wanted to bring them outside at night to show them which stars were in the psalm, but |that would have been impossible with the rules of the monastery. Would they not praise their God better if they knew the references merely by looking up at the sky at a certain time of the night, in this case, at that time, just before, during and after Nocturnes, and see the work of God? As I wrote last week, the supernatural grows out of the natural. The Medievals knew this, as their lives were intimately chained to the seasons, the skies, the plants. But, our modern life separates from nature, from God's creation, of which we are a part. We are not disembodied spirits, but flesh and blood. The Church, rooted in history, and our God, a God of history, give us the sacraments, singing, sacred signs and efficacious words and symbols to become holy. I pray that all who desire perfection start with the natural and move to the supernatural. The laity and religious alike must start with a relationship with the Creator, Who is Father of us all. I pray for more vocations, which would allow more time for God's outside work. Here is the quotation from St. Bernard of Clairvaux, from a homily of his at Easter. Clarification on a simple point. Many Catholics do not understand the difference between a priest who is a member of an order and a secular or diocesan priest. The vocation is very different. I hope for those who do know the difference, this is not too pedestrian. An order, such as the Benedictines, Dominicans, Franciscans, Fraternity of St. Peter, or the Institute of Christ the King have various things in common. I shall list those: first, an order has a spirituality unique to that group of men. Second, most are missionary in scope and call. Third, the members make unique vows to the order. By the way, even some Benedictine orders are missionary, having a vow of stability to the order and not to a monastery, such as the Tyburn nuns. Fourth, the members of an order live in community, unless they are Jesuits in certain areas, or have at least one other priest with them in their work. A secular or diocesan priest is under obedience to his bishop and works in a diocese, usually. The call to be a diocesan priest is not a missionary call, although a bishop may send a secular to Rome to teach, for example, or to a capital to work in the archdiocesan or national offices. The spirituality of such men varies greatly according to the order, or the diocese. Some diocesan priests would be more Ignatian in their spirituality, as St. Ignatius wrote a rule for the active life. However, the spirituality of a secular priest is that of the apostle working in the world under authority, but without a specific rule. The secular must say daily Mass and his breviary, but he is under no obligation to sing the hours, or to have the type of strict obedience which a monk owes his abbot, for example. A secular priest has the right to say no to something and discuss possibilities with his bishop. The fraternity of secular priests is built up by friendships and groups in the deaneries. Most diocesan priests wear blacks, though not all, and few wear soutanes (cassocks). Their life is very active, and these priests need great care from their parishes, which sadly in most places is lacking. The live alone, mostly, except in large urban areas, and are overworked. But, their call is that of the original twelve apostles. Their community is that which they make, and not ready made, as in the great orders. Also, secular priests do not make a vow of poverty. Living in the world can be expensive and harsh. Many dioceses give a minimum to their priests, and I know some countries where families help out the priests in their families out of necessity. God's call to a young man is specific. One either has a religious vocation in addition to a priestly one or not. This is determined with spiritual directors, or vocations directors, or even abbots. One can discern through self-knowledge where one's talents and temperament fit into the Church. It is very hard to be a diocesan priest in these days. Pray for your priests. Do not judge them too harshly. Pray for the seminarians. Pray for more vocations. I know many parents who would not want their boys to be priests. I personally believe this is sinful-to stand in the way of God's call to a son is a serious thing. There are not a lot of canonized saints who are diocesan priests. One reason is that the established orders have had more means, such as influence and monies, in Rome, in order to push the process. This is not a cynical statement, but simply a matter of process and ease. St. Jose Maria Escriva, who I consider a great saint, had a relatively easy time becoming canonized as his order was organized. This is the same reason why there are so few lay saints formally canonized. One needs, as it were, sponsorship in Rome. St. John Vianney is the patron saint of diocesan priests. Many trad young men become diocesan priests as that is their call from God. They want to bring the Latin Mass into the community. The blogging priests are mostly secular, such as Rev. Timothy Finigan , Rev. Ray Blake, and Rev. John Zuhlsdorf, but not all. 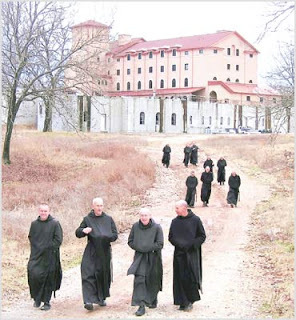 Some monasteries do not allow the Internet at all for the community. Some do. I hope this helps those who were wondering about this question.